Lexington’s demonstration project added a protected crosswalk with signage to the intersections of Bryan and East Loudon Avenues where no crosswalks existed previously. The Lexington-Fayette Urban County Government wanted to make traffic safety a higher priority when designing its streets, especially for people walking. Too many people were being hurt or killed while trying to walk along or across Lexington’s streets, especially when crosswalks were few and far between. Lexington knew prioritizing safer streets would need support from both the community and elected officials, so a team from Lexington applied for the Safe Streets Academy to learn how to better engage these groups. As part of the Academy, they launched a demonstration project at two confusing, dangerous intersections in a diverse, mixed-income neighborhood with low rates of car ownership to show how low-cost tactical urbanism improvements can create places that are safer and more comfortable for people walking, biking, and driving to share. Typically, the Lexington-Fayette Urban County Government has conducted community engagement for transportation projects through online surveys and meetings to inform the public about already planned projects. But the Lexington team wanted to use their demonstration project as an opportunity to test out the more creative ways to engage the community that they learned through the Safe Streets Academy. Instead of coming up with a solution and then bringing it to the public for comment, the team collaborated with a group of residents who led peer-to-peer engagement efforts. By letting the local community take the lead pinpointing problems at these intersections and guiding solutions to address them, Lexington was able to implement a much more effective, relevant project that enjoyed stronger support from the public. To collect input from the community, the Lexington-Fayette Urban County Government teamed up with the Citizens Environmental Academy, a program Lexington runs to teach people more about how local government works. As a reward for perfect attendance throughout the Citizens Environmental Academy, participants received $2,500 to invest in an on-the-ground project of their choice. Six of these members chose to pool resources with the Lexington Safe Streets team to fund streetscape improvements on Bryan Avenue and make two key intersections on this street safer, especially for people walking. 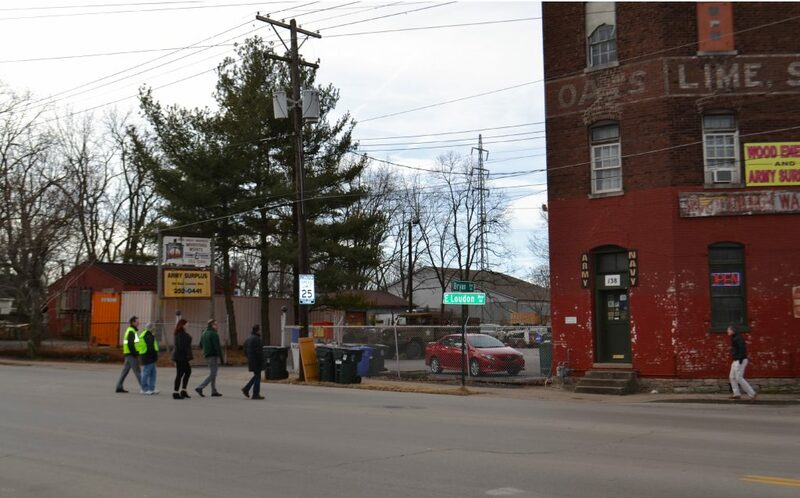 The Citizens Environmental Academy led an interactive meeting to learn how people move along and across Bryan Avenue and how they want the street to look. The Citizens Environmental Academy took the lead on engaging their peers in the community, which allowed them to move beyond the conventional engagement strategies the city uses and think outside the box on how to connect with the community. They canvassed door-to-door to businesses and residences and hosted two interactive listening sessions—one during an already scheduled neighborhood association meeting, the other at a local church. They brought maps of the site to the first listening session so people could point out barriers to getting around, opportunities for improvement, and the routes they use to navigate the area on foot, on bike, and by car. The team also conducted visual preference surveys, where attendees placed stickers to vote for how they want crosswalks, intersections, and other design features of the street to look. The Lexington team mapped what they learned about the site at their interactive community meeting to help them design their demonstration project. The main concerns people raised about these intersections included cars moving at high speeds, limited visibility for both people driving and walking at and approaching crosswalks, and general confusion about who has the right of way at intersections. The Lexington team realized these problems resulted from the way the street was designed, with wide lanes and gradual curves that made drivers feel comfortable driving through intersections at high speeds without needing to stop or slow down. Using this input, the team brainstormed solutions for the site, then, at the second listening session, they refined these ideas with the community and discussed how specific changes would address their concerns and improve safety. Bryan Avenue runs through an older, historic neighborhood of Lexington called North Limestone. People in the neighborhood have low rates of car ownership and are more likely to depend on public transit, and the neighborhood as a whole is more diverse and mixed-income compared to other parts of Lexington. Because North Limestone pre-dates Lexington’s historic street grid, it has some unusually shaped intersections that create confusing, unsafe situations for people walking, driving, and biking. 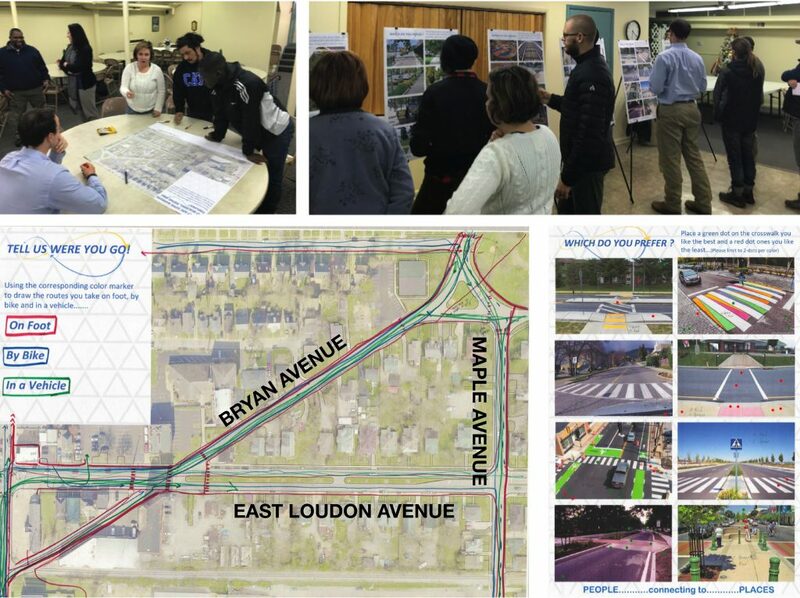 For their demonstration project, the Lexington team focused on two intersections along Bryan Avenue: East Loudon Avenue and Maple Avenue. Using feedback from the local community, they worked with the Safe Streets Academy teams from Orlando and South Bend to brainstorm ways to redesign these intersections to make them safer and easier to navigate. Before Lexington’s demonstration project, there were no marked crosswalks at Bryan and East Loudon Avenues. The intersection had only three stop signs instead of four, requiring traffic from all directions to stop except for drivers moving east on East Loudon Avenue (from right to left in the above image) who could make left turns onto Bryan Avenue without slowing down or yielding to opposing traffic. Bryan Avenue intersects East Loudon Avenue at a confusing, unusually angled intersection. Although four directions of traffic meet at this site, only three legs at the intersection had stop signs, so cars traveling east on East Loudon Avenue could speed through without stopping. Based on community input, the team knew a lot of people walk along and across these streets, but there were no marked crosswalks at this intersection. To make it safer and easier to navigate for people walking and driving alike, the Lexington team extended the landscaped median to create a new pedestrian refuge for people crossing. 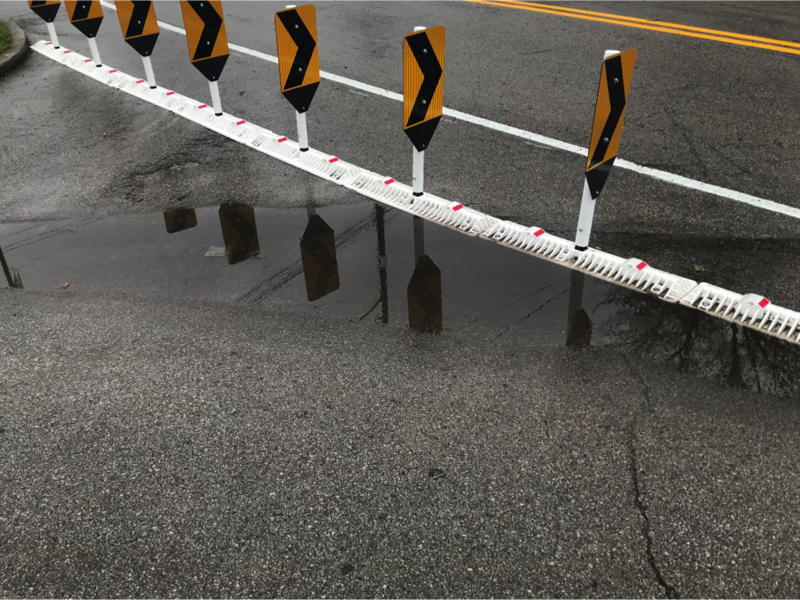 They used reflective posts that the city had in storage to protect this pedestrian island and to create bump outs that narrowed the road, encouraging people to drive more slowly. They also used these bump outs to reshape the atypical angle of the intersection into a more conventional right-angled corner, so people driving south on Bryan Avenue would have to come to a more complete stop before turning. 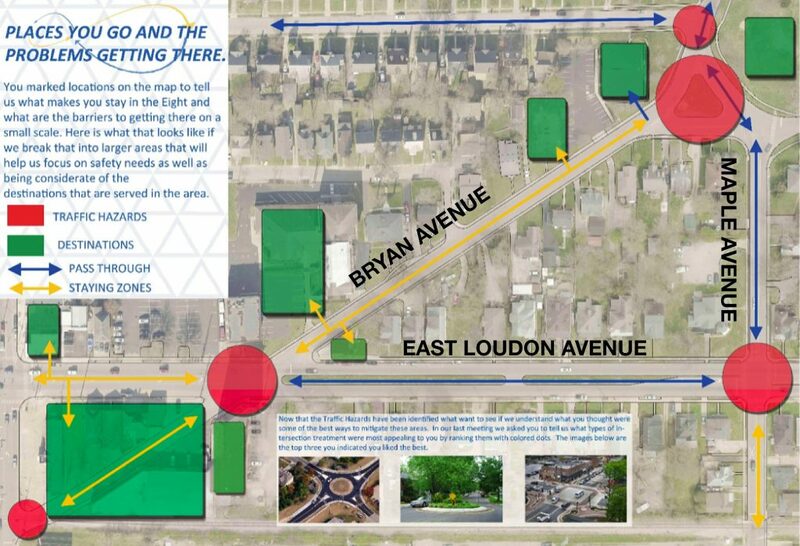 By extending the median past the intersection of Bryan and East Loudon Avenues, Lexington’s demonstration project limited the movement of cars across the intersection to make the street safer and more predictable. 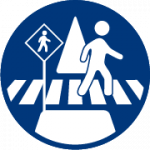 Lexington’s demonstration project introduced a new crosswalk at the intersections of Bryan and East Loudon Avenues with a protected refuge to make it safer and easier for people to cross the street. Lexington’s redesign of Bryan and East Loudon Avenues included bump outs and a protected mid-block crossing using temporary vertical posts. The intersection of Bryan and Maple Avenues was also difficult to navigate, especially for people walking and biking. The intersection’s unusual triangular shape allowed cars to bypass stop signs and speed through the space. It also lacked marked crosswalks to connect people to the adjacent church and park, and the community pointed out that the few crosswalks that did exist had little to no visibility of the rapidly approaching cars—and vice versa—making it dangerous to cross the street. To address these safety concerns and transform this intersection into a place where people felt comfortable walking, the Lexington team added crosswalks where the community noted they were missing and closed off one leg of the intersection to cars entirely, redirecting drivers to a stop sign so they could no longer speed straight across. By temporarily closing a leg of Bryan Avenue at Maple Avenue, the Lexington team redirected cars to a stop sign and created more space for people to walk along and across the street. One advantage of using a temporary demonstration project meant the team could make small adjustments and changes as needed. For example, the project interfered with stormwater drainage at the intersection of Bryan and East Loudon Avenues. After a heavy rain, the team discovered some “ponding” up against their installation, but because their demonstration project used flexible materials, they were able to quickly resolve this problem by making a strategic saw cut to allow water to pass through. Troubleshooting minor challenges like this one through a demonstration project will help the team make informed decisions—and justify them—if they convert these temporary improvements into permanent changes to make their intersections safer. Stormwater started pooling at Lexington’s demonstration project, but the team was able to quickly resolve the problem with a saw cut. The team plans to leave the demonstration project in place for two to five months and hopes to make permanent safety improvements at the site. To do so, they’ll need support from the local community and local elected officials, but they can use the success of their demonstration project and the positive response from the community to justify future investments in safer streets. 1. Let the community lead the way. Instead of going through the typical process of coming up with a solution for how to change the street and then presenting an already refined plan to the public for comment, the Lexington team used their demonstration project as an opportunity to test out more interactive methods of community engagement, and even surrendered control of parts of the process to encourage greater buy-in and support from the community. They let the community lead the way in defining the specific problems at these intersections and guiding the vision for how to address these problems. They also empowered volunteers from the Citizens Environmental Academy to take the lead on conducting peer-to-peer engagement. This level of public engagement helps build a constituency for supporting the project or others like it. By giving the community increased ownership over this project, the Lexington team tailored the type and location of safety improvements more closely to the actual needs and desires of the public. This also helped to generate stronger support for the project from both the community and elected officials. Community support and ownership will be essential to convert the changes on Bryan Avenue into permanent safety improvements and to launch future demonstration projects. 2. Make the most of the resources at your disposal. The Lexington team was able to cut costs and work more effectively by making the most of existing opportunities for supplies and partnerships. 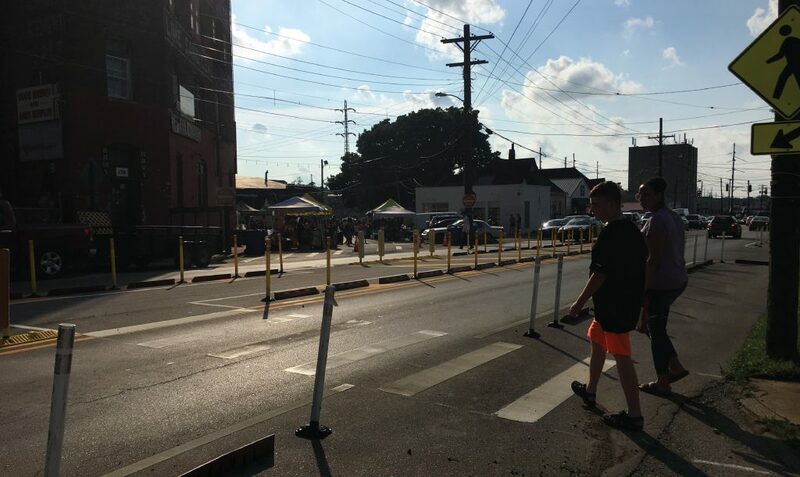 The team recycled some of their materials for the project from city storage, including the reflective posts, and they used low-cost, high-impact materials such as chalk and paint to temporarily reconfigure the intersections. They also collaborated with on-call consultants and with volunteers who shared their goals for improving Bryan Avenue, including the Citizens Environmental Academy. As a result, they were able to implement their demonstration project at very low cost. The Safe Streets Academy is funded by Road to Zero, a coalition of almost 700 organizations committed to reducing traffic fatalities in the United States to zero over the next three decades. To learn more about this demonstration project and similar projects in Orlando and South Bend, read the full report here. To learn more about this demonstration project and similar projects in Orlando and South Bend, read the full report here.